Of all the sleazy companies to show up in North Dakota’s oil patch in the nearly ten years since the Bakken Boom began, the sleaziest of them all has to be Meridian Energy, the company proposing to build an oil refinery called the Davis Refinery just three miles from Theodore Roosevelt National Park. Here’s why I say that. Normally, when a company wants to build a large energy plant, like a refinery, it applies for a siting permit from the North Dakota Public Service Commission. Most good companies do that. It’s the law. In the case of oil refineries, if the refinery is going to be capable of processing more than 50,000 barrels of oil per day, they have to obtain a site compatibility permit from the PSC. Well, that’s reasonable enough, I guess. Take care of the people and their environment while providing the energy we need. The two should be compatible. You’d think that it might also keep a refinery away from the boundary of a national park. In its application for a state water permit, Meridian is requesting enough water—645 acre feet per year—to supply a refinery processing 55,000 barrels of oil per day. In its application for an air quality permit from the North Dakota Health Department, the company makes its projections on how much pollution they will be producing based on a 55,000 barrel per day refinery. Explaining the water permit request, Bender reiterated that Meridian only planned to build a 27,500 bpd, but again said again “it is a possibility” that the plan could expand in the future. And in response to the question on the air quality permit, he said basically, “the Health Department made us do it.” Well of course they did. They knew what Meridian was up to. They ain’t stupid either. Bender then went on to say that under an old attorney general’s opinion, issued in 1976 by then-Attorney General Allen Olson, “applications to different state agencies concerning the same energy conversion facility need not be identical.” What? That made no sense to me, so I went and read that opinion, and didn’t quite read it that way, but then I‘m not a lawyer. I know former Attorney General (and Governor) Olson reads this blog. Maybe he’ll remember. Attorney General’s Opinion 76-130. Bender’s conclusion: Meridian doesn’t believe those two applications trigger a site compatibility review by the PSC, and they will not seek a certificate of site compatibility. So they plan to just go ahead and start building a refinery, without PSC permission. So we’ve got a standoff right now. I’ve talked to two of the three PSC members about this, and they’re mulling it over. They gave it a run, and the company told them to get lost. So until Meridian puts a shovel in the ground, there’s not much the PSC can do. It’s pretty obvious that the reason Meridian doesn’t want to apply for a site compatibility permit is that they believe the PSC might NOT issue a permit for this location if they applied for one. Well, that seems pretty stupid. Now they’ve really pissed off the PSC. We’ll see how this plays out. Meanwhile, Garland Erbele, the State Engineer over at the Water Commission, did take some action, announcing he was granting a water permit for only 90 per cent of the water Meridian had applied for. His logic: If he only gives Meridian enough water to build a refinery capable of processing 49,999 barrels of oil per day, then Meridian can’t build its 55,000 BPD refinery. There, Take That, Meridian! Cute. Real Cute And pure pap. You don’t think Meridian might have a “fudge factor” of ten per cent or so in its request? In other words, Thanks, Mr. Erbele. That’ll be just fine. Really, Erbele’s little stunt is beneath the dignity of a state government agency. That’s playing Meridian’s game. You want to send Meridian a REAL message, Mr. Erbele? Grant them a permit for enough water to process the 27,500 barrels per day. Meridian says it “might” come back later and decide to expand its refinery capacity to 55,000 bpd, but right now it’s at 27,500. So give them that much. And tell them if they decide to expand, you “might” give them more water. There’s precedent for that. Way back in 1974, one of Erbele’s predecessors, Vern Fahy, who worked for Gov. Art Link and Agriculture Commissioner Myron Just (the two elected officials on the State Water Commission), got an application from Michigan Wisconsin Pipeline Company for water to build a whole bunch of coal gasification plants in western North Dakota. The company requested 68,000 acre feet (Yeah, kind of makes that refinery look like small change, doesn’t it?) and the Water Commission granted them just 17,000 acre feet—a fourth of what they wanted. Wise men, Link and Just. In the end, they didn’t even need that much for the one plant they built—which, by the way, is still in operation today. Further, they attached a whole list of conditions to the permit. At the time, North Dakota didn’t have much in the way of mined-land reclamation or air pollution laws, so they wrote some, and attached them as conditions to a water permit. Most of those conditions were eventually enacted by the Legislature and became law. An aside—that water permit and its conditions became the entry point for then Tax Commissioner Byron Dorgan’s involvement in North Dakota environmental matters. Just and Link had Dorgan ask Attorney General Allen Olson if those conditions could stand the test of law. Olson opined that he thought they could, and so they were valid. Credit those four men for leading the way to protecting North Dakota’s environment. We could use four more of them today. Link’s gone, but the other three are still around. Wonder if they’re busy—today’s government leaders could use some advice about what to do with a rogue company like Meridian. Meanwhile, today’s leaders need to do what those four great leaders did in the 1970’s—circle the wagons, and sit down and figure out what to do about this sleazy company. Governor Burgum and Public Service Commission president Julie Fedorchak need to display some leadership here. They need to get all the players in the room—the PSC, the Water Commission, the Health Department, and maybe even the State Securities Commissioner (don’t be surprised if THAT office needs to engage at some point)—and figure out how to get this company in line. Surely Byron Dorgan and Art Link and Myron Just and Allen Olson would not allow a company such as this to build a refinery three miles from the national park named for our country’s greatest conservation president. An oil refinery and a national park are not compatible. And we can’t move the national park. But we can move the proposed refinery. That’s why we have Section 49-22.1 of the North Dakota Century Code. Let’s enforce it. Pretty much everybody would agree that building a refinery in North Dakota is a good idea. 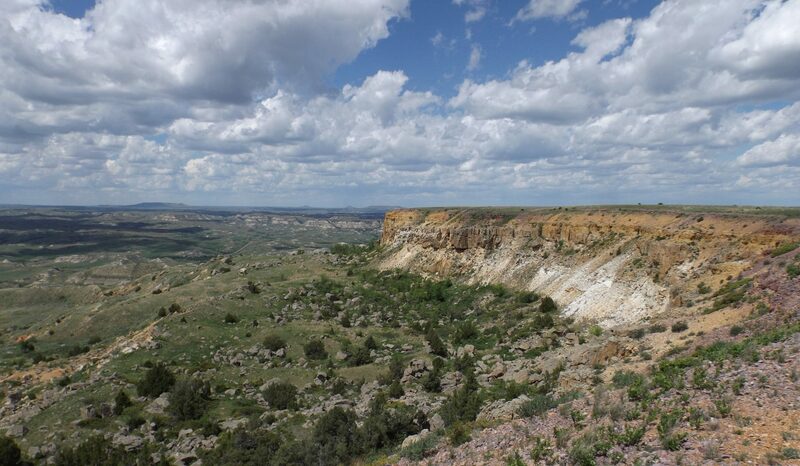 Pretty much everybody would agree that three miles from a national park is the wrong place to build it (except for three people—the Billings County Commissioners, who get to collect massive property taxes from it). There’s going to be lots more to this story. I’ll try to keep you posted. Meanwhile, there is now a 30-day comment period for people who commented on the application last year to submit more comments. Seems like a goofy law—anybody should be able to comment on action of a governmental body, any time. But then I was one of those who commented last year, so I get to comment again. Here’s my letter. As a follow-up to my earlier 2016 comments on the application of Meridian Energy for a water permit for 645.2 acre feet of water per year (enough to process 55,000 barrels of oil per day) for its proposed Davis Refinery, I want to tell you what I think of your decision to only grant them a permit for 90 per cent of the water they requested. So, Mr. Erbele, if that’s their plan “at the present time,” I suggest you give them enough water “at the present time” to operate a refinery capable of processing 27,500 barrels per day. If, as they also say in their letter, they may “sometime in the future” propose an addition to the refinery to process more than the 50,000 barrels per day which would trigger a site review, then they can come back to you “sometime in the future” and ask for more water. Do you really believe that cutting their request by ten per cent will keep them from achieving the full potential of their proposed 55,000 barrels per day facility? No responsible engineer on their end would cut an estimate that close on a refinery not even completely designed yet. Surely they have built in a “fudge factor” in case their original water use estimates are too low. Just take a look at the press release they sent out to their investors—90 per cent will be just fine, thank you. We all know the game Meridian is playing with North Dakota state agencies to avoid having to undergo an environmental assessment and plant siting review by the PSC. For a state agency, the North Dakota Water Commission, to join them in their game is beneath the dignity of government regulators. Previous postA Victory for the Good Guys. And the Bad Lands. Next postThe Newest Bridge Across the Little Missouri State Scenic River. What the . . . ? Jim, I support the concept of an oil refinery in the Bakken if it is well thought out and strategically planned. Transporting Bakken oil by railcar is dangerous and has proven fatal, as we all know. Like you, I DO NOT support an oil refinery’s location near a national park. It would pollute a tourist area and would likely hurt our tourism industry. Detail questions: When was Meridian originally granted the permit by the State Water Commission? What evidence did Meridian present to attain the permit? What would be the water source for the refinery? Most importantly, can the State Water Commission rescind its decision because information has been uncovered that indicates this is a poorly thought out proposal? Federal government question: Because the South Unit of Theodore Roosevelt National Park is within a stone’s throw of this proposed facility, what power does the federal government have to stop this proposed refinery? Is this on the U.S. government’s radar? Any corporate entity using bribery, obfuscation and outright bullying as a business model should be shut down. Nothing good for the State of North Dakota and its environment will come from dealing with Meridian. State officials making critical decisions for the People of ND should have comprehended – very early on in 2014 – that Energy Transfer Partners would do whatever it needed to do to ram through its objective for DAPL. Were our ‘officials’ lulled into a trance, bribed, bullied, blackmailed? You simply do NOT negotiate with dishonest people or entities! Why be surprised when the snake strikes, you knew all along it was a rattler? We ND Sodbusters share an appreciation for simple common sense so, as you observe and I agree, the national park can’t be moved so move the refinery to a location separate and distinct from the park. Re my AG opinion, while I don’t recall the specific circumstances, the respective agencies of state government have separate and distinct duties and responsibilities. AG opinions reflect those differences.